There are so many exciting ways to celebrate the holidays in the Lowcountry! From sleigh rides on the water to shows and parades, we have it all in the Charleston area. Drive through the lights while your Christmas music on the radio plays to the beat! Stop and shop, drink hot cocoa, and roast some s’mores by the fire. 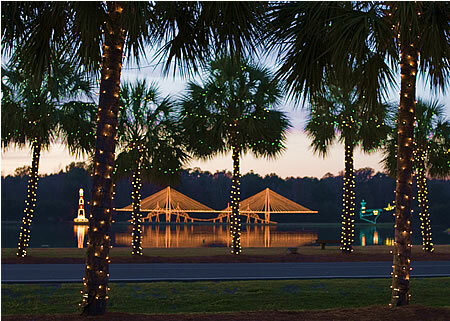 The James Island County Park has over 3 miles of must-see holiday lights on display for the whole family. By popular demand, this holiday favorite returns. Celebrate the warmth of the holidays with Ebenezer Scrooge, Tiny Tim, and the spirits of Christmas Past, Present, and Future in Charleston Stage’s original and imaginative take on Dickens’s immortal classic. Check out their website for pricing and show times. Children will take center stage this holiday season as Magnolia Plantation and Gardens unveils a newly designed Children's Holiday Village with kid-sized structures. This year, the Children's Holiday Village will be in the new Children's Garden, a sprawling area where children can explore nature and a fairy garden. Stroll along Candy Cane Lane and visit Santa's Workshop, Candy Factory, Gingerbread House, Barbershop, Post Office, Chapel, General Store, Elf Bunk House, and "Elfementary" School. Ride the Holiday Express and visit with Santa Claus every Saturday and Sunday in December between 11-3 pm. The Reindeer Run, presented by Half-Moon Outfitters, is a family-oriented, pet-friendly 5k run/walk through the lower peninsula of downtown Charleston. Santa comes to Folly Beach every second Saturday in December! Enjoy the floats going down Center Street as they throw out candy and pass out prizes! Join our Mayor, along with Santa and Mrs.Claus for hot chocolate and marshmallows! 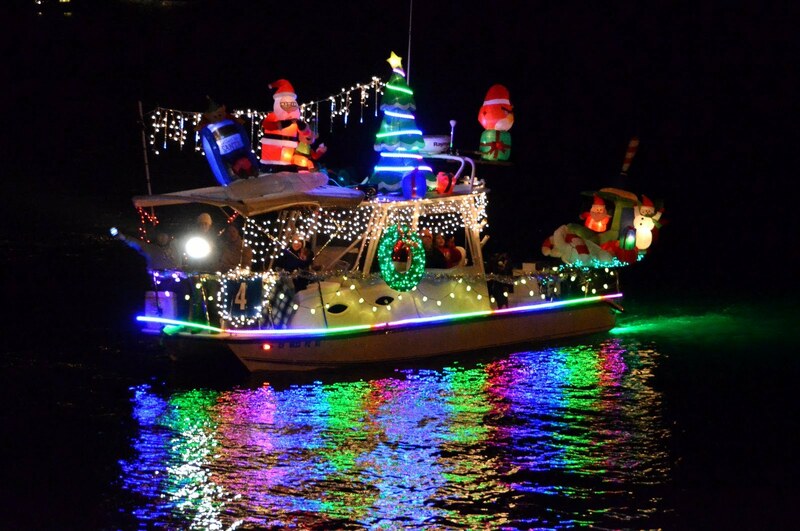 For the 37th year running, watch the boats light up the Charleston Harbor with your friends and family! There are prizes awarded to the 1st, 2nd, and 3rd place boats in both the power and sail categories, along with highest scoring boat overall receiving the award for the best-in-show! More than 10,000 people make the Charleston Christmas Special part of their holiday tradition each December, and this year will be no exception. Producers Brad and Jennifer Moranz have worked all year to create a brand-new holiday show that's nothing short of spectacular. Some of the most talented singers, dancers, and musicians from around the country will gather on stage for this holiday production suitable for all ages. 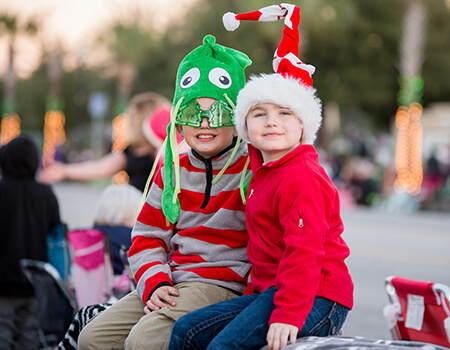 Along with the annual tree lighting, there are over 100 floats in the Mount Pleasant Parade going down Coleman Boulevard. Residents and visitors alike love to witness this annual festivity! In December, Pegasus Charters offers the "Original" Charleston Sleigh Ride. Bring along your favorite foods and drink and enjoy the sights of Charleston and the low country from the water as you listen to some good, fun Rock-N-Roll Christmas Carols. This is not a narrated tour, it's a time of gathering with family and friends, slowing down for a few minutes during the holidays and just enjoying the holiday spirit. From December 14 through January 1, the second annual Cougar Night Lights holiday spectacular transforms the College of Charleston's historic Cistern Yard and Randolph Hall with a specially designed light and sound show. Look for custom, festive holiday designs on the historic façade and wintry string lights draped through the campus' famed live oaks. Projections, costumes, and characters are faithfully brought to the stage against a backdrop of nostalgic set designs. The 12-foot-plus-tall Abominable Snow Monster is jaw-dropping. The cast brings high energy to classic songs and dialogue, while irresistible and loveable puppets highlight the charming “roughness” from the television show’s stop-motion effects. Book your stay in one of our vacation rental properties to have a restful and relaxing holiday season. Happy Holidays from our family to yours!